Heat oven to 325°F. Spray bottom of 13x9-inch pan with cooking spray. Make brownie batter as directed on box for cakelike brownies. Spread in pan. Bake 22 to 25 minutes or until toothpick inserted 2 inches from side of pan comes out almost clean. Cool 10 minutes. In large bowl, beat cream cheese with electric mixer on medium speed until smooth, scraping down sides of bowl frequently. Beat in 1 cup dry cake mix. Reserve remaining cake mix for another use. Add 2 eggs, 1 at a time, beating until just blended. Beat in milk, vanilla and sprinkles. Spread evenly over brownie crust. Bake 20 to 24 minutes or until set. Cool 30 minutes on cooling rack. Refrigerate about 2 hours or until cooled completely. Cut into 6 rows by 4 rows. Cover and refrigerate any remaining brownies. Be sure to soften cream cheese to room temperature; if cold, cheesecake filling will be lumpy. Try these delicious mug cake recipes for remaining dry cake mix. Gone are the days when the words “cake batter” evoked thoughts of ooey-gooey, unbaked dessert mix (not that there’s anything wrong with that!). Today, cake batter is a bonafide flavor in its own right. Warm vanilla, decadent cream cheese and sweet sprinkles make up this dessert’s cake-batter essence while fudgy brownies provide that gotta-have-it chocolate factor no dessert should be without. 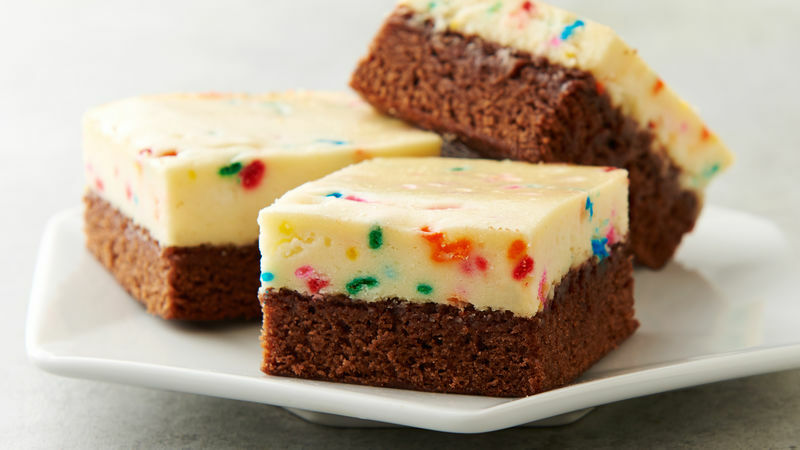 Don’t be surprised if after one bite of cake batter cheesecake brownies, you’re inspired to bake up some of our other brownie treats. They’re just as irresistible and easy—pinky swear.